By now, you’ve probably seen a great deal about our IaaS platform making business sense. Our Wholesale Cloud Platform provides a turnkey cloud computing infrastructure you can use to launch your own cloud, complete with a white label rebrand, integrated account management and no CapEx. We think it’s pretty cool. But how did we build it? How does the underlying technology work? Today we thought we would give you a look under the hood of our distinctive cloud architecture. Firstly, we use the industry standard Xen Hypervisor to run your customer’s virtual machine instances. Xen is a microkernel hypervisor that allows us to run multiple instances on the same physical server, all with complete isolation and security. We host this equipment in our Equinix data centers around the world. Compared to other hypervisors, Xen provides the performance we were looking for, along with the rock solid reliability and security that our customers demand. On most of our instances, we take advantage of a specific mode in Xen called PVHVM – which stands for Paravirtualised Drivers on HVM. This delivers the best of both worlds, the operating system support and CPU performance of HVM (Hardware Virtual Machine) with the Network and Disk performance of a PV (Paravirtualised) driver. Utilizing Xen, we are able to run almost any operating system within our environment, including Linux, Windows Server and FreeBSD. But then we do more! For those well versed in Xen, IaaS and cloud infrastructure, none of what we’ve discussed so far may sound new. Where we differentiate ourselves from other cloud computing infrastructure or IaaS providers is our breakthrough, InfiniBand-backed architecture. In traditional Infrastructure as a Service (IaaS) systems, instance storage and compute are often physically located on different servers. Storage is placed in a storage area network (or SAN) cluster, and is connected to the compute nodes with some form of network (usually Gigabit or 10 Gigabit Ethernet). This design has worked reasonably well for Amazon’s IaaS platform, so other providers have tended to emulate it. While this segregated approach sounds reasonable, easy to maintain and cost effective in theory, it comes with several shortcomings. Our intimate knowledge of Ethernet, informed even further with Gordon Bell‘s mentorship and investment in our platform, tells us it’s not ideal as a storage conduit. In a nutshell, the best-effort approach and variable latency of Ethernet was simply not designed for sustained, high speed, reliable data transfer. At the level it operates, it lacks the capacity to determine packet loss, link level flow control, and can’t be efficiently used to aggregate bandwidth. 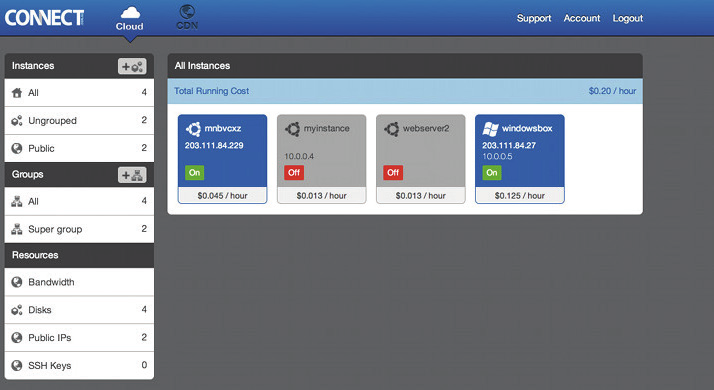 This traditional, EC2-clone approach also turns out not to be that cost effective either. SAN controllers and drive arrays are substantial investments, which would have to be passed on to your customers. They also represent a single point of failure and create points of storage contention within the cluster. This all leads to inconsistent and slow performance, while still being relatively expensive. Rather than work around these issues, or retrofit existing infrastructure to fit as so many others have done, we redesigned the entire system from scratch and removed these issues from the equation entirely. Firstly, our cloud infrastructure platform is built around a decentralized and distributed architecture. We utilize a homogeneous node architecture, where each node has compute, memory and storage assets. By utilizing homogeneous servers we are able to deliver greater performance at a reduced cost. Traditionally using direct attaches storage has introduced issues such as reduced flexibility and redundancy, but OrionVM has overcome this issue by utilizing a distributed storage architecture over InfiniBand, creating a virtual SAN across our cluster. This architecture reduces latency, is more cost effective, and mitigates the points of contention and failure that Centralized SANs can cause. The virtual disk of each server can be mounted on any physical server (allowing us to move the instances around the cluster) and is also replicated across multiple servers for redundancy. InfiniBand was designed specifically for low latency and sustained data transfer, making it perfect for a high performance cloud to be built on. Benchmarks and figures aside, it has also allowed us to design and develop some great features that regular Ethernet and Xen would not have afforded us. Would you like a slice of “high-availability” with that? With this redundant, decentralized InfiniBand fabric, we’re able to continuously replicate storage across several nodes while maintaining performance. It allows us to distribute storage efficiently across our cluster, as well as remove hot-spots without impacting performance for customers. As for your instances, having network backed storage allows us to automatically migrate your instances to different nodes in the event of a physical server failure, rather than having to wait for a technician to enter a data center and perform recovery operations on a physical node. This design drastically reduces downtime, simplifies the deployment of instances, and provides more immediate feedback to customers. Great, so how can my cloud be administered? This industry leading infrastructure is accessible for your customers through several channels. Central to this is our completely pre-built web panel. When you deploy your cloud using our platform, you can customize the entire front facing experience your customers will have, including logos, colors, page layout and support links. See how an Australian Telco (AAPT) deployed their CONNECT system with us. From this panel, your customers can create, administer and remove instances and their associated resources. For simpler tasks, they can be up and running with one our predefined operating system templates in minutes, with only the RAM and storage space they require specified. For more customized instances, clients are free to allocate storage and IP addresses and then pull them together into a new instance. Instances can be assigned storage and IP addresses during advanced configuration, or indeed any time they’re shut down. As you’re probably already aware, this elastic provisioning provides far more flexibility than traditional hosting providers. So, there you have it. At OrionVM, we’re proud of what we’ve built and feel the unique combination of features and functionality can help you attain your cloud computing infrastructure goals. We look forward to seeing the solutions you build using the platform. Want to be featured on the OrionVM Blog? Please drop us a note and tell us about your experience. We would love to feature your case study.